Contrary to the right-wing myth that it is being transformed into “Britain’s Islamic Republic”, the east London borough of Tower Hamlets is in reality a highly diverse place. Residents of Bangladeshi heritage comprise 32% of the total population according to the 2011 census, only slightly more than those describing themselves as “White British”, who make up 31.2% of the borough’s population, while those in the third largest category, “White Other”, account for a further 12.4%. Muslims are the largest religious group, but at 35% of the population they are heavily outnumbered by people of other faiths and none. In a referendum three years ago the people of Tower Hamlets voted to adopt a system of local government based on a directly elected executive mayor, and Lutfur Rahman decisively won the ballot to select the Labour Party’s mayoral candidate. However, the party’s national executive then overturned the result on the basis of allegations of vote-rigging (later revealed to be without substance), and imposed one of Lutfur’s defeated rivals in his place. In a move that had obvious parallels with Ken Livingstone’s response to an earlier selection stitch-up back in 2000, Lutfur defied the party leadership and contested the October 2010 Tower Hamlets mayoral election as an independent, achieving an emphatic victory with 52% of the vote, in part on the back of public resentment at Labour’s contemptuous attitude to democracy. As a result, he was expelled from the Labour Party. Since then, Tower Hamlets has served as a model of what a progressive local administration can achieve, even in the face of the disastrous austerity programme imposed by a Tory-led national government. Under Lutfur’s mayoralty the borough has implemented the London Living Wage, replaced the Education Maintenance Allowance after it was cancelled by the government, absorbed the government cut in council tax benefit, provided free care for the elderly and disabled, set up an energy co-op that saves residents an average of £120 a year on gas and electricity bills and built more new homes than any other local authority, while September will see the introduction of free school meals for the youngest primary pupils and bursaries for university students. If the Labour Party leadership had any political sense, they would have restored Lutfur’s party membership and allowed him to stand as the official Labour candidate in the next mayoral election, to be held in May next year. But when Ken Livingstone put that proposal to a national executive sub-committee in January, the only vote it received was his own. A subsequent attempt to raise the issue on the national executive itself was blocked. Lutfur will therefore have to stand as an independent again, facing rival candidates from the Labour, Conservative, Liberal Democrat and Green parties, and in all probability from UKIP too. His achievements in delivering for the people of Tower Hamlets will make it very difficult to attack him on the basis of his record in office. So, in view of the demographics of the borough and given that a low turnout can be expected (in 2010 it was only 25.6%), there is an obvious temptation for Lutfur’s opponents to try and stampede backward sections of Tower Hamlets’ white population into voting against him by falsely claiming that under his mayoralty non-Muslims are being discriminated against in favour of the Bangladeshi community. So far, there is no sign that his opponents have any intention of resisting that temptation. As a taste of things to come, the Tower Hamlets Tories have recently been exploiting an application by a local Bangladeshi group to erect a small community centre on a disused plot of land at Island Gardens on the Isle of Dogs. A single-storey portakabin with brick cladding, the proposed building is intended to host a variety of educational and cultural activities, including youth and women’s groups, drugs awareness and mother tongue classes, as well as serving as a prayer hall. While the planning application states the centre will be primarily directed towards the needs of the local Bangladeshi population, it gives an assurance that the centre’s “facilities will be made available to the whole community irrespective of their religion or ethnic background”. It’s a small-scale development that you might have thought would cause little controversy, and in normal circumstances the application would be dealt with by planning officers under delegated powers. But the Tories have spent the last few weeks whipping up hysteria over the proposal. They obviously intend to take it to the council’s development committee, where they can politicise the issue further. 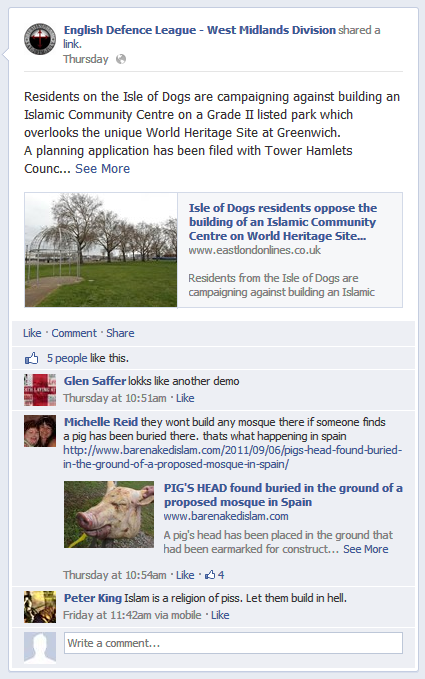 “Anti-mosque” campaigns like this follow a predictable pattern. They are usually characterised by a two-faced approach whereby the incitement of hostility towards Muslims is combined with the contradictory assertion that hostility to Muslims is not the real motive behind the campaign. The main excuse given for objections to a new mosque or Islamic centre is typically concerns over traffic, parking and noise. Sure enough, these do form part of the opposition to the Island Gardens plan, but here the central justification presented is the supposedly disastrous impact the development will have on the character of this popular Thames-side park. Some of the petition’s signatories make no attempt to hide their anti-Muslim views. 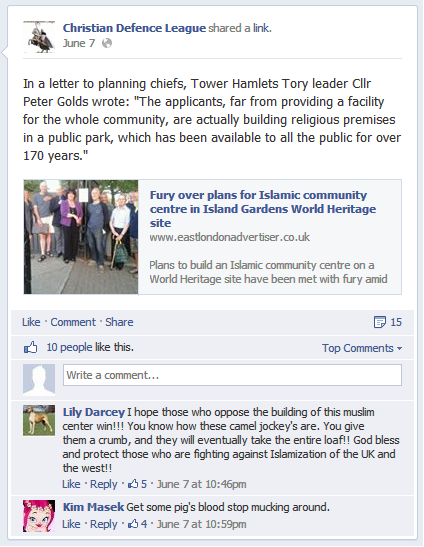 The comments they have added include: “We’ve had enough of community centers that serve only one part of the community and wreck the British heritage”; “The proposals for the usage of the building are sectionalist, racist, sexist and religiously sectarian”; “Everyone knows that unless you are a Muslim then you will NOT see the inside of this place”. One signatory demands “no more mosques in the UK”, while another declares that it is “Time to fight back and stop the evil spread of Islamification in Britain”. Unsurprisingly, given the way both the Advertiser and East London Lines have echoed Tory propaganda about the proposed centre, most of the comments stress the need to preserve the character of Island Gardens as an unspoiled public park. There is an endless succession of objections along the lines of “Leave our green spaces alone!”, “Please preserve this green space for all who can appreciate it”, “These pockets of green need to be cherished”, “London needs these ‘green lungs’ for the emotional health of its people” and “Stupid idea to put a portacabin on one of the few remaining green places on the Island”. The Tories also fed their version of the story to Sunday Express and former Advertiser journalist Ted Jeory, who ran a piece on his Trial By Jeory blog on 3 June. His post featured pictures of Island Gardens in all its leafy splendour, and of the unrestricted view it provides across the Thames, while echoing the Tories’ claim that these features of the park were now under threat. “This is a mosque in all but name”, wrote an indignant Jeory of the proposed community centre. “Or perhaps a Trojan Horse for a mosque. In a Grade II listed public park that was set aside by its founders for the benefit of everyone.” Jeory even phoned up Tower Hamlets planning department and pestered them with silly questions about whether he’d be allowed to “erect a community centre inside Victoria Park”. However, Jeory decided it would be an idea to visit Island Gardens and examine the site where the “Trojan Horse” was to be placed. When he arrived there, Jeory found that the site isn’t even in the park. He reported: “It’s in a walled-off area where the council’s gardeners used to have a storage shed. It’s now not used for anything.” The planning application confirms that this is indeed the case. It states clearly that the building has been designed so as “NOT to encroach on Island Gardens Park and surrounding amenities” and will instead “make positive use of an empty and tarmacked area adjacent to the Gardens/park”. A map with photos is provided to illustrate this point. Yes, seriously, this is the priceless green space that the Tories and their supporters declare should be preserved unspoiled, as a legacy “for the coming generations” – a dingy, disused yard, surrounded by a rather ugly brick wall and covered in tarmac. At present it serves no useful function for anyone. Not only would the proposed centre put this vacant lot to good use, but it would be barely visible to most people using the park and would certainly be no more prominent than a building directly next door that contains a set of garages. Since it is at the far corner of the park away from the riverside, it would have no impact whatsoever on the view across the Thames. It’s easy to take the piss out of the nonsense spouted by the Tories on this issue, but their irresponsible scaremongering has had the effect of stoking up racist sentiments towards the Bangladeshi community, not only within Tower Hamlets itself but also among violent extremists from outside the borough. Among those far-right groups who have seized on the controversy is the English Defence League, who have proposed that a pig’s head should be buried at the site (which admittedly won’t be easy, as they’ll have to break through the tarmac first). The EDL-aligned Christian Defence League for its part has welcomed Peter Golds’ stand against the proposed development (“God bless and protect those who are fighting against Islamization of the UK and the west!!”). 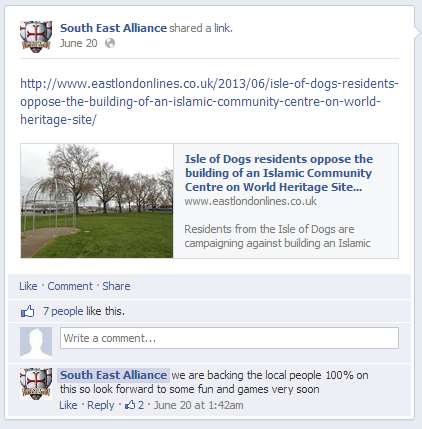 Another extremist organisation inspired by the Tower Hamlets Tories’ campaign is the South East Alliance, a particularly thuggish offshoot of the EDL who specialise in threatening and intimidating political opponents. They have warned that “we are backing the local people 100% on this so look forward to some fun and games very soon”. You may say this is no more than we have come to expect from the Tories, but the Labour Party in Tower Hamlets hasn’t been innocent of dog whistle politics either. They recently accused Lutfur’s administration of prioritising wards that provide the mayor with his base of support on the council, when carrying out housing improvements under the Decent Homes Programme. This accusation has unpleasant echoes of the campaign waged by the British National Party in Burnley a decade ago, when the Labour Party was falsely accused of channelling funds to wards with large numbers of Labour-supporting Asian voters. In Tower Hamlets, as in Burnley, the real criterion according to which resources have been allocated has been need. This Labour campaign, too, has been taken up by the EDL (“Tower Hamlets Muslim Mayor Lutfur Rahman accused of prioritising supporters in housing works”), provoking understandable anger from the mayor and his supporters. Here we see both Labour and the Tories trying to gain political advantage over Lutfur Rahman and undermine his prospects of re-election, without any concern for the damage they cause to community relations in Tower Hamlets or the inspiration they give to the far right. You would hope that Labour Party activists, and even the more civilised members of the Conservative Party for that matter, would draw the line at this sort of unprincipled politics and hold their leaders to account, ensuring that the forthcoming mayoral election contest is a clean fight. Unfortunately, the way things are going, you’ll probably be disappointed.